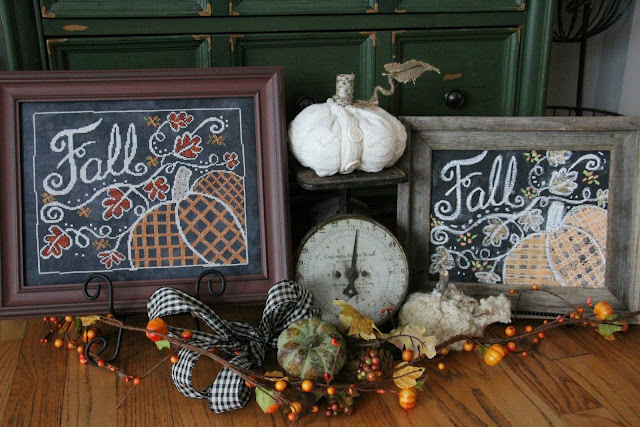 I am so excited it's time for another Seasons In Chalk in the October 2016 Just Cross Stitch Magazine! Cathy's stitched model is on the left and my chalkboard on the right..
As soon as Labor Day comes and goes my Fall decor comes out and I can't wait to have this up until it's time for the Halloween Seasons In Chalk! I stitched mine on 28 count black Monaco using the called for threads..It is mounted on a vintage paint by number frame from an Estate Sale that I had a board cut to fit and painted with chalkboard paint. 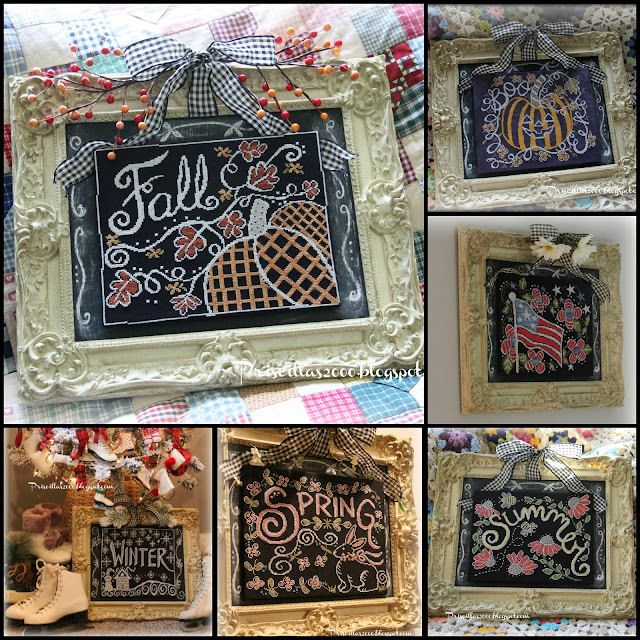 I use magnets on the back of the frame and small pieces of sheet metal on the back of the stitching to change the designs out for each season ..
Only one more design after this one is left in the series ..It has been so exciting seeing all the stitched up pieces on Facebook and Instagram ! Here are the 6 so far! "BOO" is in my Q-snaps with a 2 day start. 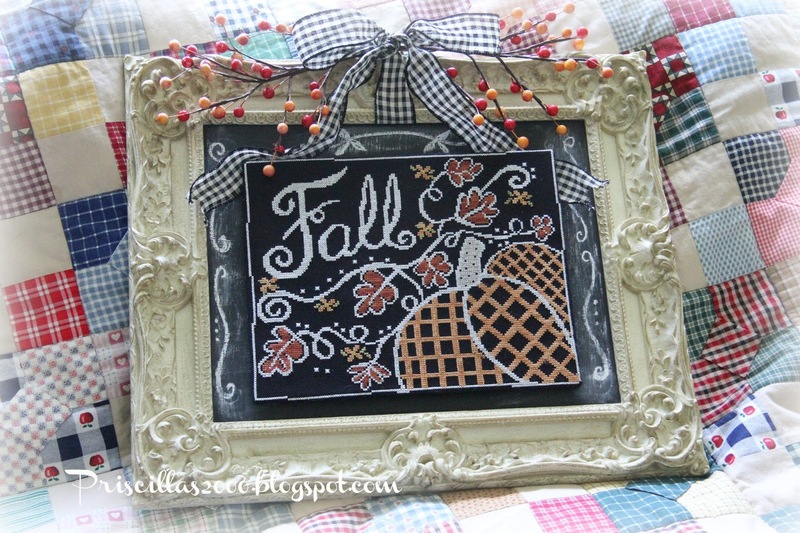 Thank you offering your talents for our stitching pleasure. Those are awesome Priscilla! I am with you As soon as September is here, the Fall comes out. I have to stretch my favorite season as long as I can. 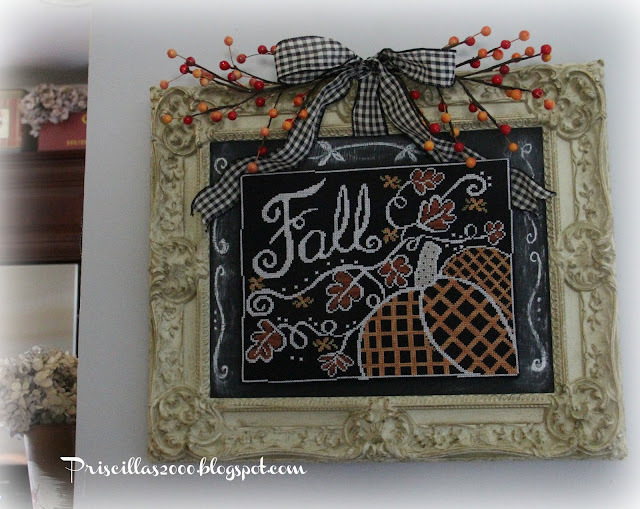 We don't get a true Fall here, so I create my own in my home! 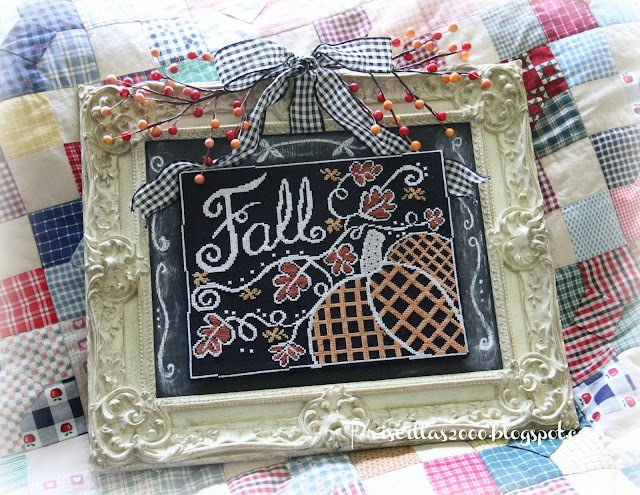 If I only lived in a true Autumn place, but with the help of faux flowers, etc and beautiful inspiration like your blog makes it better:). Enjoy your (hot!) day!! Where would we be without AC this summer? These are really inspiring. I am quite determined to follow your lead just as soon as the grandchildren head back home and I have some free time. Your work is so lovely. Just found your blog and I will be reading all of your past posts! I love looking at your work. You make me really want to try to do these fun seasonal cross stitch patterns. 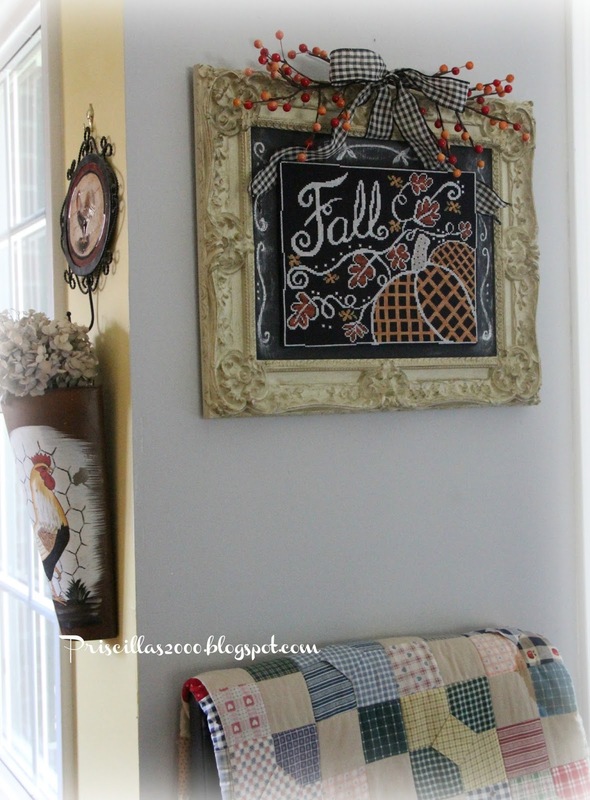 I used to do needlepoint, so I know I could do this too... Just don't have time for another project! These little stitchery pieces are lovely and the frames are just perfect for them.